As scheduled, Apple's iPhone 7, iPhone 7 Plus and Apple Watch Series 2 went up for preorder early Friday in nearly 30 territories around the world, including key markets in North America, Europe and Asia. In the U.S., the preorder process started a bit late for some customers, but appears to be running smoothly on Apple's own website, the Apple Store app for iOS and the respective online storefronts of its partner wireless providers. 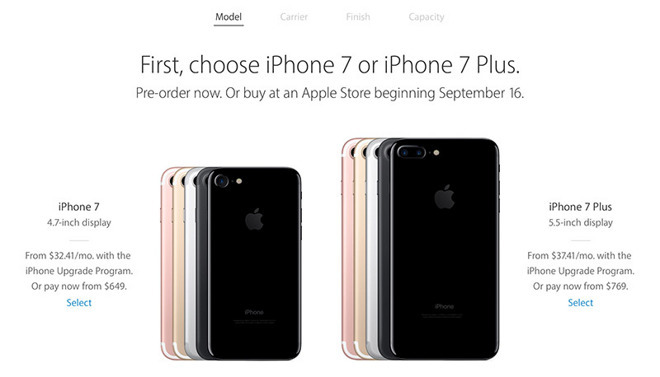 Apple.com sometimes experiences server issues when a new iPhone model launches due to overwhelming demand. Apple is launching iPhone 7 and 7 Plus in 29 countries, including Australia, Austria, Belgium, Canada, China, Denmark, Finland, France, Germany, Hong Kong, Ireland, Italy, Japan, Luxembourg, Mexico, Netherlands, New Zealand, Norway, Portugal, Puerto Rico, Singapore, Spain, Sweden, Switzerland, Taiwan, UAE, the UK, US Virgin Islands and the U.S. Preorders are slated to arrive on Sept. 16, the same day Apple is expected to have stock on hand at its retail outlets. Looking ahead, preorders go live in Andorra, Bahrain, Bosnia and Herzegovina, Bulgaria, Croatia, Cyprus, Czech Republic, Estonia, Greece, Greenland, Guernsey, Hungary, Iceland, Isle of Man, Jersey, Kosovo, Kuwait, Latvia, Liechtenstein, Lithuania, Maldives, Malta, Monaco, Poland, Qatar, Romania, Russia, Saudi Arabia, Slovakia and Slovenia on Friday, Sept. 23, while customers in India will get access to the new phones on Friday, Oct. 7. With the industry moving away from two-year contracts, U.S. handset pricing starts $649 for the 4.7-inch iPhone 7 with 32 GB of storage, while a step-up 128 GB model runs $749. The maxed out 256 GB model sells for $849. The 5.5-inch iPhone 7 Plus starts at $769 for 32 GB of storage, moving up to $869 for 128 GB and $969 for 256 GB. Apple announced iPhone 7 at a special event on Wednesday. Outside, the handset remains largely unchanged from iPhone 6 series devices, but inside are a variety of upgrades like the speedy and efficient A10 Fusion SoC, solid-state home button, enhanced cameras, a dual-camera system for iPhone 7 Plus, wide color gamut display, stereo speakers, a bigger battery and more. As rumored, Apple deleted the 3.5mm headphone jack from iPhone's design, but the change afforded space for a refined Taptic Engine and allowed engineers to implement a water resistant design. Apple opened preorders for Apple Watch Series 2, Series 2 with Nike+ band and the revamped Series 1 in 27 markets, including Australia, Austria, Belgium, Canada, China, Denmark, Finland, France, Germany, Hong Kong, Ireland, Italy, Japan, Luxembourg, Netherlands, New Zealand, Norway, Portugal, Puerto Rico, Singapore, Spain, Sweden, Switzerland, Taiwan, UAE, the UK and the U.S. Like the iPhone 7, Apple Watch Series 2 shipments and in-store availability are scheduled to arrive next Friday. The Nike+ version is slated to arrive some time in October. Apple will open Apple Watch Series 1 and 2 preorders in Anguilla, Antigua and Barbuda, Cayman Islands, Croatia, Czech Republic, El Salvador, Greece, Guam, Hungary, Jersey, Kuwait, Macau, Monaco, Poland, Qatar, Romania, Russia, Saudi Arabia, Slovakia and the US Virgin Islands on Sept. 23, and in India and Mexico on Oct. 7. Apple Watch Series 2 starts at $369 for all 38mm aluminum versions, while 42mm models come in at $399. Pricing is identical for the Nike version. Stainless steel and Space Black stainless steel Apple Watch Series 2 models start at $549 for the 38mm version with sport band, or $599 for 42mm. The white ceramic edition comes in at $1,249 for the 38mm case, while the 42mm version is set at $1,299. With the Series 2, Apple packs a slew of new hardware into the original Apple Watch design, with additions like GPS, a dual-core processor, brighter screen, swim-proof housing and an all-new ceramic casing option. All models ship with watchOS 3, which boasts a redesigned user interface, new apps, snappier operation and more. Apple also updated Series 1 devices with its new dual-core chip and dropped the starting price to $269. Make sure to check out AppleInsider's hands-on look at Apple's new iPhone 7 and Apple Watch Series 2 for more information. Update: Due to constrained initial stock, Jet Black iPhone 7 models now ship in 2-3 weeks, while the 7 Plus is at over one month.